When we last saw BloodRayne in 1935, she joined forces with the shadowy Brimstone Society to destroy a supernatural Nazi bid for dominance. Her father, Kagan, an influential Nazi collaborator, was killed in an accident at the close of the War. Cheated of killing Kagan herself, Rayne has spent the last sixty years ferreting out and destroying his many offspring, her siblings. They have banded together and formed the Cult of Kagan, pledging to carry on his legacy of creating a new era of vampire supremacy where humans are mere cattle for the bloodthirsty predators that hunt them. BloodRayne's nefarious siblings have created "The Shroud", a mysterious substance which, when released, renders the sun's lethal rays harmless to vampires and twists nature into a nightmarish perversion. 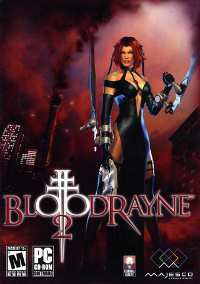 Now only BloodRayne stands between an unsuspecting humanity and a horrifying vampire dawn.